There are a host of reasons why companies and organizations partner — and many reasons why they succeed or fail. One of the Top Ten Ingredients of Successful Partnerships is achieving alignment on vision and values with your partner. I believe good partnerships have a shared vision of what they are expected to accomplish and have shared values on how they operate. This doesn’t mean you have identical expectations, but there should be a mutuality and synergy in your thinking. In my experience, it is best to have these discovery and alignment discussions on vision and value before you actually launch a partnership. The definition of an alliance is a collaboration to combine your resources and expertise to create greater value together than you can alone. This is where alignment starts. What are you trying to achieve together? How are you creating value for your shared customers, and how is value created for each partner? When you encounter conflicts and differences in your partner relationship (and you will), often these can be resolved in a positive way by going back to the mission statement and solving the conflict in a way that best serves the mission. My company, Phoenix Consulting Group, specializes in helping companies find more value in their most important, strategic business relationships. 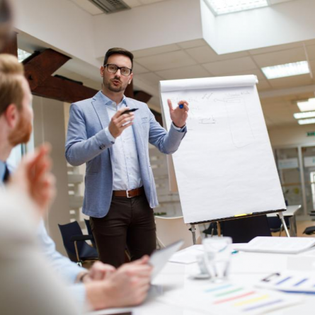 As part of our practice, we conduct training and workshops designed to help professionals and executives to gain the knowledge and competencies needed to manage these critical business-to-business (B2B) partnerships. In our collaborative skills mastery workshops, we conduct an exercise that asks the participants to craft a joint vision statement between two companies. In one instance, it is between a pharmaceutical and a biotech who are partnering to develop a therapy for Alzheimer’s disease. Most of the participants come up with a vision statement similar to: “We will combine our joint expertise and resources to create an effective therapy for the treatment of Alzheimer’s.” This is a very serviceable vision statement that is clear on the purpose of the partnership. However, one group stated something much more powerful. Their vision statement was, “We will relieve the suffering of Alzheimer’s patients and their families.” You could hear a gasp sweep over the entire class. They had articulated a vision statement that was visceral, inspiring and embraced underlying common values. I believe one has to also consider the more hard-nosed business alignment constructs as well. Your partnering strategy should align with your corporate strategy. The anticipated business objectives of your partnership should be stated in clear metrics. Your plan of action should be specific in what tasks need to be completed by when and who. These constructs should all tie back to your vision statement. They serve to align the business operations and day-to-day activities to the vision statement in a way that leads to results. Aligning values also serves to keep a business relationship on track. Again, your values and those of your partner’s don’t need to be identical, but they should be complementary and synergistic. Consider partnerships among highly entrepreneurial companies and Fortune 100 types. The company cultures would likely be very different because there are different underlying value systems. Entrepreneurial organizations must be able to move quickly to take advantage of fast-moving market opportunities. Large companies depend on process and bureaucracy to manage complex business operations and global market reach. Both types of organizations might value innovation and agility. Their common values unite them, but their differences are what enable a partnership for value creation. You can easily anticipate where there would be friction between an entrepreneurial company and a bureaucratic one in how they operate. One approach to bridging these differences is through a set of operating principles. The following points are examples of what these principles could be — principles that help embrace shared values and express them in a way that prescribes behavior. 1. Focus on the customer, and create superior added-value. 2. Meet commitments and milestones on time. 3. Keep communications open, honest, proactive and timely. 4. Make decisions quickly, practice team ownership and base decisions on rational risks. 5. Address problems before they escalate; fix quickly. 6. Create opportunities for growth and breakthroughs. Note how many times “quickly” or “timely” is expressed. Both partners might value speed, but it could mean different things. It is good practice to define what “quickly” means to you because it would be very different at a scrappy startup versus a large multi-national company. In business, we are not often able to advocate a vision statement that is as moving as the Alzheimer alliance example above — one that connects to our values as strongly as relieving suffering and wins the hearts and minds of all stakeholders. At a former company, we used to joke that we were making the world safe for middleware (an obscure type of software); not exactly motivating or a strong vision for alignment. But even a serviceable vision statement can become the guiding North Star of the partnership. Shared values guide the behaviors to collaborate effectively. Together, the alignment of vision and values gives the partnership the impetus to solve problems together, overcome obstacles and collaborate to create amazing results.